The fourth edition of this workbook adds new information in the field of speech-language pathology and also from new phonology tests and assessment reviews. It is practical, easy to understand, and a valuable supplement to the practicing clinician or to students studying articulation and phonology. 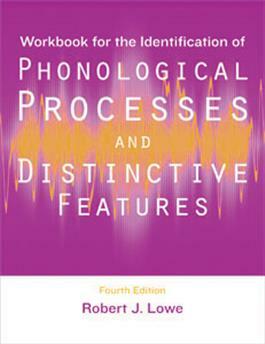 Workbook for the Identification of Phonological Processes and Distinctive FeaturesÃ¢â‚¬â€œFourth Edition provides a foundation for understanding concepts/constructs used by contemporary tests and assessments in articulation and phonology, focuses on most frequently used processes and features, familiarizes students with phonological processes and distinctive features, and provides hands-on practice with answer keys. Groups of phonological processes are presented along with their definitions. Exercises are provided at the end of each major section to help the reader develop a working knowledge of various processes. Answers to these exercises and to two mini-quizzes appear at the end of the book.